When she left the corporate world behind 20 years ago, Sharon Moncrief’s path took an entirely different turn. A lifelong love of plants, an interest in alternative medicine, and relationships she’d developed in Boulder, CO, led Sharon out West where she first studied herbalism. 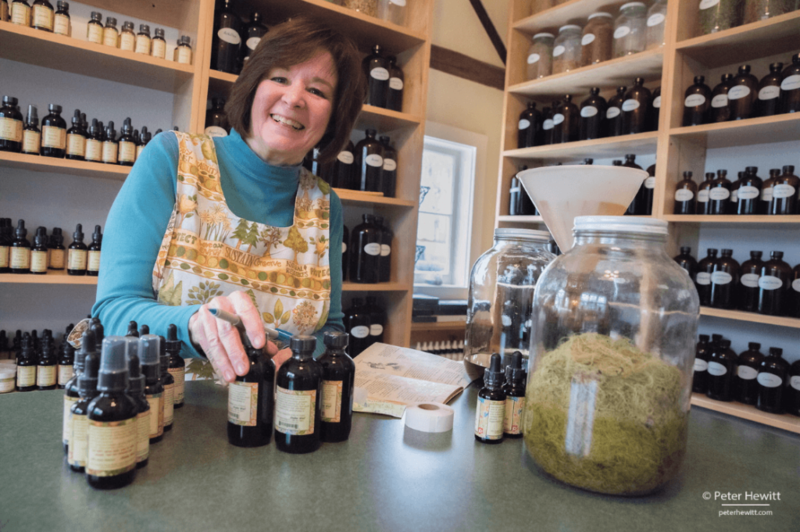 Her eventual return to the East Coast included further study in the field, and Sharon has now been operating her herbal studio out of a renovated barn in Bucks County for upwards of 12 years. In addition to handcrafted herbal remedies, Sharon also offers individualized consultations and creates custom formulas for her clients. More than 70% of the herbs used in Sharon’s practice are either wild harvested or grown nearby at Barefoot Botanicals, a certified organic herb farm in Doylestown, PA, specializing in medicinal and culinary herbs. Sharon’s strong commitment to a “buy fresh, buy local” philosophy extends beyond just food to include medicine as well, which not only makes her partnership with Barefoot Botanicals a natural match, but also fueled her desire to sell her herbal tinctures at Kimberton Whole Foods stores. Greenbrier Herbalist extracts, tinctures and remedies are created using an approach rooted in thousands of years of tradition. Unlike highly manufactured herbal products, Sharon’s process involves chopping fresh herbs by hand before running them through an old-fashioned press. Sharon stresses that herbal medicine is not meant as a replacement for pharmaceuticals. The herbal approach is one that draws from the wisdom of our grandmothers, and focuses on understanding, trusting and aiding the body’s own inherent healing processes. This entry was posted in Apothecary, Farms, Local Story and tagged apothecary, Herbs, local producer, local product, local story, Real Deals, sale. Bookmark the permalink.